If you thought the Marvel Cinematic Universe was coming to a close with Avengers 4...then I can't help you. Seriously, there's no way the most lucrative collection of movies in the world was going to end, but apparently some have misread Kevin Feige's recent comments to mean exactly that. Which is crazy. No, there will be plenty more superheroes and plenty more Marvel adventures to follow in Phase 4, and James Gunn has revealed which movie will be kicking the next storyline off. Can you guess which one it is? Duh, it's in the headline. Of course it's Guardians of the Galaxy Vol. 3. 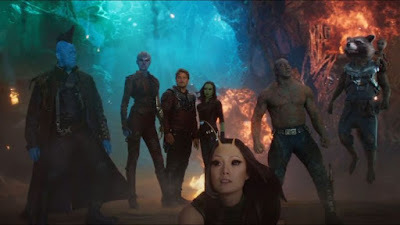 For one thing, Gunn is talking about it so naturally he's involved, but also because the Guardians may be the only superteam left at that point. Who knows where Captain America, Iron Man, Thor, and the rest of the Avengers will be, or if they will be at all. Don't expect to learn anything about Phase 4 anytime soon. Avengers: Infinity War has been kept under lock and key tighter than any Marvel movie so far, and the title of Avengers 4 is said to be very spoilery (I think it's Avengers: Secret Invasion, personally). The next 'Guardians' should hit around 2020, which seems far off but these Marvel dates tend to sneak up quick.